What do making ice cream, doing laundry and playing marbles have in common? They are all part of an exciting new program for fourth graders, created by and being run by JPPM docents, under the guidance of Education Director Kim Popetz. Entitled “Kids’ Work”, this program takes a look at what life was like for African American children growing up in post-Civil War Calvert County. 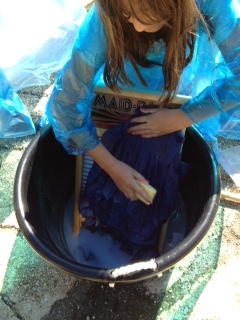 Scrubbing clothes with a washboard is hard, wet work! The lives of children are often overlooked in historical documents and this program uses archaeological findings, oral history, and other sources to help students understand how life was both different from and similar to their lives today. Despite their newly-gained freedom, African American families often found themselves in circumstances not much different economically or politically than what they had known before the Civil War. A significant number of families took up tenant farming and, while education was highly valued, the labor provided by children past a certain age was also needed to help the families survive. This program focuses both on the work and the education of children following the Civil War. Over the course of the fall and next spring, every fourth grader in the Calvert County Public School system will visit the park to participate in this program. 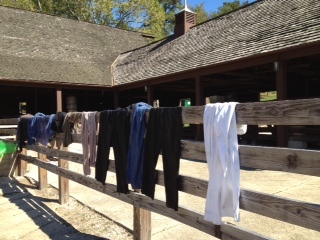 Newly-cleaned clothes drying on the fence. Students begin their program with a visit to the Sukeek’s Cabin site, where they learn about one farming family and see artifacts found at the site. Particularly interesting are slate pencils and an alphabet plate that suggest that the Dawkins family were practicing reading and writing at home at a time when there were few schools for African American children. The students then rotate between three activity stations: an everyday life station where they learn about children’s work by hauling water in buckets and washing clothes with a washboard and fels naptha soap. They then proceed to a food activity, where they discuss what it was like to procure and prepare food in the post-bellum period–a time before there were Giant supermarkets in every town. As a special treat, the students make vanilla ice cream using cream, sugar and vanilla in ziplock bags. To illustrate recreation and free time, the fourth graders make clay marbles and then learn to play a few simple marble games. 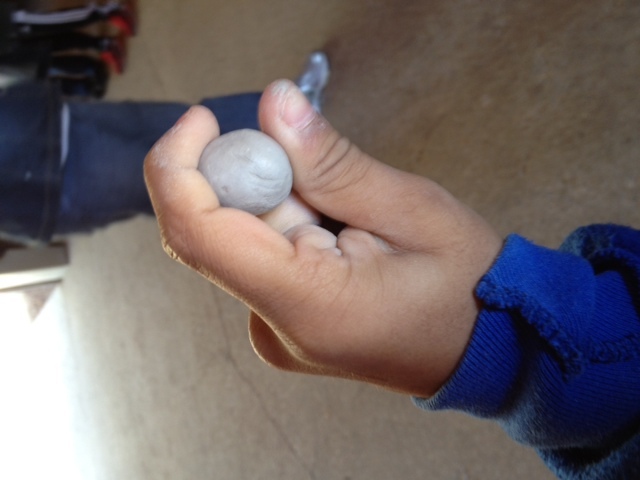 A student demonstrates the proper way to hold a shooter marble. Once the students complete the activities, they stay to have lunch at JPPM before boarding the bus to head to the Old Wallville School, one of the original African American schools in Calvert County. This portion of the program focuses on the importance of education to these families and what school would have been like during that time period. While I would have thought the ice cream station would be “hands-down” the favorite activity, according to Kim, the students really like doing the laundry! Go figure! Early reviews are rave: one student wrote on her evaluation that it was “the best day of her life”! Kudos to the docents and the Education Department on creating another great program! This entry was posted in General and tagged archaeology, Calvert County Md, children, education, fun, hands-on activities, history, kids, living history, school groups, student. Bookmark the permalink.